Noticing New York: BPL’s Bklyn BookMatch- A Match For The Human Race’s Book Future? : Electronic Books and Robot Librarians? BPL’s Bklyn BookMatch- A Match For The Human Race’s Book Future? : Electronic Books and Robot Librarians? Brooklyn Public Library president Linda E. Johnson envisions staff reductions if her idea of a “new” state-of-the-art Brooklyn Library is ever built, not surprising since the “new” library she wants to “replace” the exiting one would be a mere fraction of the current library’s size. Such staff reductions would follow on the heels of staff reductions at the BPL and a switching away from professional library staff that has been going on for a long time now. Librarians who once ran libraries have been replaced with “site managers” which sounds more like a real estate term. The BPL has also shifted away, in general, from hiring professional trained librarians, replacing them with lower-level clerks. Ms. Johnson said that she did not know exactly how many fewer librarians would work at a smaller Brooklyn Heights Library in Downtown Brooklyn, that “the numbers have yet to be determined," but that her hope is that when built the "new building will be a model of efficiency" with a reduced staff that would not have to compensate for the drawbacks of dealing with a library that was of an "improperly" large size. But does Ms. Johnson (problematically not a librarian herself) even know what a librarian should be, what functions they perform by being on site? At the BPL’s September 16, 2014 trustees meeting, Ms. Johnson and her staff proudly unveiled a way to replace on-site reference librarians with an electronic service substitute, a sort of virtual reference librarian system that can respond to a patron's inquiry, and by virtue of calculating "appeal factors" (BPL’s terminology to describe the service) will tell e-mailers what books they want to read with a week's turnaround time. Of course, as you are not face to face with a live person this won't be exactly such a chance either, but it goes along with how we shrink libraries for real estate deals. The BPL says it's recommended that the responding e-librarians try to make these responses "as personable as possible." How will this work? You might stroll into your local library to begin this computerized interaction to help find and discover what books you want to read. Linda Johnson’s vision of any library into which you might stroll is a place from which physical books will soon almost entirely disappear. Books take up space and, when they disappear, libraries can be made much smaller, facilitating selling off their real estate, like with the Brooklyn Heights Library, the Donnell Library or the NYPL’s Central Library Plan (derailed at the moment). 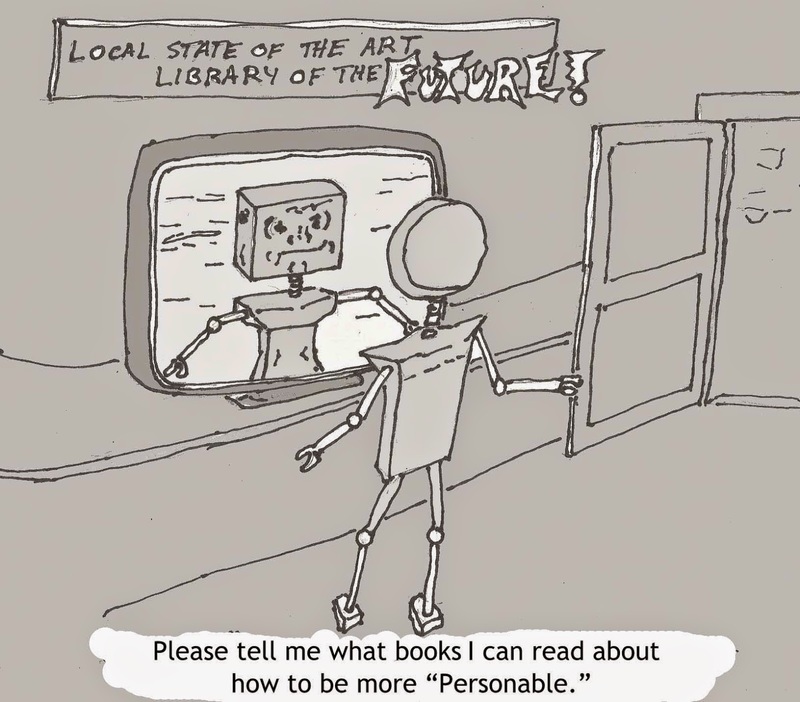 If you stroll into a bookless library for your computerized interaction you won’t have the other ways of selecting books available to you. You won’t be able to browse the shelves or discover that a book you really want but didn’t know about is “adjacent to the book” you thought you wanted to find (“it’s never the book you want, it’s the book beside the book.”). You won’t find the book you didn’t yet know you wanted because it luckily attracted your attention by being unusually and promisingly fat sitting on the shelf, because it was unusually thin, because it was lovingly worn out, and unusually old. You won't find it because it was in sparkling just-arrived condition, or because it caught your eye on the reshelving cart or as a librarian reshelved it because somebody else hot on the trail of the same kinds of things you might be looking for might just have used it. You won’t start up a conversation because you have bumped into someone else with your interests wandering in the same section. There will be none of this kind of `serendipity’ (if that’s what one should call it). And it's unlikely you’ll take home a book home from that bookless library that same day. You might not choose to go into the library at all for your computerized interaction, the benefit of ever visiting that physical library perhaps being minimal, unless you are one of the 27% of New Yorkers that the NYPL estimates are currently on the other side of the digital divide and are without broadband internet access. If you don't have your own internet access you may still be impelled to visit a physical library. • Maybe, the beginning is that the e-responding “reference librarian” is in some (central?) Brooklyn location from which all such inquiries from Brooklynites get answered. • The three New York City library systems, the BPL covering Brooklyn, the Queens Library covering Queens, and the NYPL covering Manhattan the Bronx and Staten Island too, have been in talks to coordinate and consolidate operations. Would this electronic service not seem a service high on the list for such consolidation of operations? Where will the e-responses be generated from then? • At the BPL trustees meeting it was noted that the BPL was only one such library in the country launching such a system now, that other library systems are doing similar things. Maybe then, very soon, all these systems can consolidate. Then the e-responses to Brooklynites can come from someplace in the Mid-West where the cost of living is cheaper and salaries lower. • But we have seen such out-sourcing in the past and what has ultimately happened often is that the work has been outsourced to foreign countries like India where, while many people still speak and read English, the salaries are still even markedly lower. • New York library administrators continue to push to overcome public resistance as they seek to shift patrons away from physical books and over to the electronic books. Amazon can supply those books and that way Amazon can keep track of each page you read on your Kindle and how long you spend reading it and. . . . that way Amazon can make very good recommendations. • Will it be actual professional reference librarians who provide these services in the future? . . . Or will there be shortcuts? Maybe even the obvious ultimate shortcut: Perhaps, after the system has made do for a time with workers in India (that did or, like Ms. Johnson, didn’t spend time in school to claim library degrees), the system will progress to what could be the inevitable next step. . . the e-responders need not be human beings at all! With a few of those Amazon-copyrighted algorithms mashed up with some Artificial Intelligence programs there could be a set-up that works beautifully with the “bots” that these days roam our virtual universe without our being able to tell the difference. Is there anything wrong with all this? Can’t we simply hail it as the marvel of efficiency that it probably and most certainly is? The book collections of New York’s libraries used to be curated by librarians assigned to the different area libraries who got to know their communities and would attend book-fair events to assess, based on their familiarity with their patrons, what books should be added to that particular library’s collection. More recently, decisions about what books will be made available in local libraries around the city are being made more `efficiently’ from a central administrative location. It's done based on call slip data that can be aggregated and then the frequency with which a book is borrowed stands in for its value. When City Council member Ben Kallos met with Citizens Defending Libraries (as a co-founder of Citizens Defending Libraries I was part of that meeting) he identified a pitfall with this approach: At one point he had been involved in efforts to substantially augment the supply of Japanese language books in the Roosevelt Island Library. The library administration officials soon wanted to get rid of the books again. . . Because there were no call slips showing that the community was borrowing the books. The books were, in fact, being used, Kallos explained, but due to cultural difference they were being used by patrons visiting the library and reshelving the books after reading them, not thinking in terms of taking them out of the library. The library was regarded as the place to do one’s reading of library books. Let me drum up some gloom. A couple of weeks ago I went to the first day of a two-day conference held at Cooper Union on the dystopian aspects and perfidious promises of technology (Techno-Utopianism and the Fate of the Earth). The conference organizers managed to put together an impressive 24 hours worth of speakers (Bill McKibben and Ralph Nader were featured Saturday night) on subjects that were individually highly fascinating, but in the aggregate bleakly depressing, especially given the warnings being dispensed about everything from Monsanto’s Genetically Modified Organism strategies, to synthetic biology, to the Genetic Redesign of Human Beings. .
. Some of the themes and insights discussed were how techo-fixes are destined to disappoint and lead ever onward to the need for more techo-fixes (Michael Huesemann), and how illusory technical “progress” has substituted as a distraction for what once was the goal of social progress (John M. Greer). Many of the speakers came back to certain common refrains like how technology can lead to massive and rapid societal dislocations (corporate land grabs in Africa and third world countries- Anuradha Mittal- or replacing dairy farmers with factories that produce synthetic milk from vats of genetically altered yogurt- Jim Thomas) and how those in control and already at the pinnacles of power regularly forerun the game, steering the promise of technology (or often just masquerades of its promise- GMO’s that don’t really produce more food or are not close to being off the drawing board, “yellow rice” that does not actually supply vitamins better than alternatives) to seize and redistribute even more power and wealth to themselves. * These two things, dislocations and increased imbalances of wealth and power, are often related. The comparative superiority and reliability of the natural and organically evolved existing order of things was also frequently mentioned, together with observations of how technicians tend to ignore such superiorities with anthropocentric hubris. Efforts to de-extinct the Passenger Pigeon, likely to be futile, are phenomenally expensive and resource-absorbing compared to preserving existing threatened species (David Ehrenfeld) . . . Aquanautic swarming robots designed to chop up jellyfish that clog and shut down nuclear power plants around the world (Eileen Crist) are a side-show compared to the global warming and overfishing that cause these exploding populations that some fear may soon take over the oceans entirely. As we ascend into the techosphere of an ethereal ethernet existence does the concept of place, physical existence and physical interactions fall by the wayside, no longer important? That’s a hard question. Last month I attended WNYC/WQXR’s Community Advisory Board meeting and Graham Parker, General Manager and Vice President of WQXR, spoke about his goal for WQXR, the New York classical music radio station, to succeed as a worldwide radio station:. He referred to “grand ambitions” to be “the Number One brand in classical music” with many listeners already in Ireland, Japan, Korea and China. He cited a recent 19% growth in international listeners, and a 34% growth in national users. This is an example of “placelessness,” of, as Mr. Parker put it, succeeding “way beyond our terrestrial borders.” At the same time Mr. Parker expressed optimism about fulfilling that ambition because, based in New York (an example of “placeness”), WQXR was well-situated to do so: "New York is the best place to launch yourself from, into a national or international market. We’ve got the best of everything in this city, and we’ve got the access to it." For better or worse, another aspect of this is that WQXR views itself as competing with every other classical music station in the world. That competition may make for better quality and increase the variety of high-quality offerings that listeners who are able to roam an entire globe of offerings can choose from, but, conversely, it also can ultimately diminish who, on the other side of this equation, gets to participate in accessing the global audiences. A classical listener listening to another classical music station is not listening to WQXR and, vice versa, a listener to WQXR elsewhere on some far away spot of the globe is not listening to their local station. . . .on-line efforts of this sort could create siren servers, even nonprofit ones, which could end up undermining the finances and security of academics. . .
. . . Students at colleges ranked lower than Stanford would tune in to Stanford seminars, and gradually wonder why they’re paying their local, lower-ranked academics at all. If locals are to remain valuable once a globalized star system comes into being over the ‘net, it can only be because they are present and interactive. But online experts can also be made virtually present and interactive. . . Artificial intelligence can animate a simulated tutor. . .
Why should we keep on paying for colleges? Why pay [to support] a privileged class of middle-class people? . . This is a pattern we’ll see over and over again. . . You get an incredible bargain up front. . , but in the long term you also face reduced job prospects. In this case. . fewer academic jobs. .
. . .Get educated for free. . But don’t plan on a job as an educator. He also observes: "digital networks have thus far been mostly applied to reduce [the] benefits of locality," the ability to be a "local star" knowing, and locally serving with particularity a local neighborhood. Notwithstanding, I have a certain love of technology so I don't want to be overly negative. And It would be unfair of me to present theories about where the future of electronically accessed off-site reference librarians might take us without first finding out the experience that this service presents now. Accordingly, I decided to try it out. I have found extremely enlightening books about how we collectively create value in society, culturally, economically, technologically, and politically, largely through what we share and the ways we interact, how the multiplicity and variety of those interactions accelerate and contribute to advancement, essentially why "civilization" and "city" as words share the same route. I seek out books for insight about the world that will, hopefully, improve my instincts (escaping or countering pulls in wrong directions) and equip me with tools for my own participation in that dynamic, hopefully responsibly and justly. Reiterating somewhat, I am attracted to ideas about the importance of the public realm, the public commons, the need to respect and protect it, and the rules humankind makes up, democracy included, in efforts to shape our shared society even as the world organically self-organizes itself. Though civilization may represent what humankind complexly unites to create, I have found terrifically consonant edification in books reminding us that the natural realm is foundationally shared too, communally by all the planet's species, with convincing analysis that economics and ecology, functioning with similar overlapping principles, ultimately meld to erase dividing lines when it comes to establishing the interactive balances essential to thrive or survive. Topics of particular interest: Communications industry, concepts of property and forms of ownership, money in politics and reforms to address it, organic development, and checks and balances on power, hubris and imbalanced dominions. "The Master Switch: The Rise and Fall of Information Empires," by Tim Wu. I enjoy its brilliant illustration of how, without corrective intervention, the communications industries bend toward monopoly or monopsony with probably detrimental cultural, political and societal consequence. "Common as Air: Revolution, Art, and Ownership," by Lewis Hyde. It convincingly makes the case for the societal advancement and organic benefits that derive from knowledge that's shared as part of a broad and extensive commons. All of Jane Jacobs' books, including the most obscure, "The Question of Separatism: Quebec and the Struggle over Sovereignty." Jacobs is more famous for a single book, "The Death and Life of Great American Cities," but I especially like most of her more developed work: "The Economy of Cities," "Cities and the Wealth of Nations," "Systems of Survival" and "The Nature of Economies." I enjoy Jacobs' rigor and preference to learn from the closely observed rather than through the received prisms of the theories of experts. As more elucidation about Jacobs, I enjoyed the book by Jacobs' protege, Roberta Brandes Gratz: "The Battle for Gotham: New York in the Shadow of Robert Moses and Jane Jacobs." "The Power Broker: Robert Moses and the Fall of New York," by Robert A. Caro. Caro's perpetual preoccupation with the intricate working of power was first addressed to this era of urban change. "Gotham: A History of New York City to 1898 (The History of New York City)," by Mike Wallace. I live in New York, so knowing about its history informs what I observe around me. "The Federalist Papers," by assorted Founding Fathers, John Jay, James Madison, Alexander Hamilton. How important the understanding and thinking about the need for checks and balances on human faults and frailty and what mechanisms will work. "Republic, Lost: How Money Corrupts Congress--and a Plan to Stop It," by Lawrence Lessig. A study of how money in politics delivers bad decisions and outcomes and how the problem of that money can be counteracted. "Who Owns the Future?" By Jaron Lanier. This book fascinatingly grapples with the anomaly of how wealth in the technological era is created, in a broad-based way, via the contributions of all of us, and yet technology concentrates wealth in a few, economically squeezing the middle class to an ever greater degree economically and in humanistic terms. Examples: Accelerating technological improvements mean "that more and more things can be done practically for free . . . When machines get incredible cheep to run, people seem correspondingly expensive." and "If observation of you yields data that makes it easier for a robot to seem [like you and replace you] then you ought to be owed money for [that]. This is such a simple starting point that I find it credible, and I hope to persuade you about that as well." "The Origins of Political Order: From Prehuman Times to the French Revolution," by Francis Fukuyama. Looking at how we evolve better, stable governance. "The Wealth of Nations," by Adam Smith. A seminal work on how capitalism works all on its own and, also, how it doesn't. "The Uses of Disorder: Personal Identity and City," by Richard Sennett. Sennett builds on Jane Jacobs' theme that humankind's attraction to ordering the world can be unhealthy and stifle growth. "Bloomberg by Bloomberg," by Michael R. Bloomberg with help from Matthew Winkler. The book, released as Bloomberg prepared to launch into politics, contains an intriguing admission that when giving money to "charities" Bloomberg always considered what he was getting back in exchange. "More Than They Bargained For- The Rise and Fall of Korvettes," by Isadore Barmash. A postmortem of how the once-successful Korvettes' chain devolved into the failure of a sell off of its substantial well-located real estate assets. Important because one of the characters in the saga is Marshal Rose, current NYC real estate magnate and simultaneously a trustee of the NYPL that is now looking to sell-off and shrink libraries as real estate deals. Are there any authors and/or types of books that you don't like? Why? Here is the response I got from the electronically available reference librarian. Portions of it, as you likely can tell, were cut and pasted from elsewhere (usually text available in multiple locations on the internet including publishers websites) and I have highlighted those sections hyper-linking back to such other locations where the text can be found. Only one book description could not be found on Amazon, the one about U.S. Supreme Court Justice Sotomayor. Amazon's description was, in this case, a somewhat customized version. I did not, as predicted, have to wait a whole week to get my response back from email address: `AskALibrarian@oclc.org'. I sent in my request middle of the day Friday and the response came back to me at the end of the day the following Monday. Thank you for using Bklyn BookMatch! Based on your interests, I’ve created a customized reading list for you. The books I've selected cover a wide range of topics and interests, much like your impeccable reading taste. In the list below you will find titles focused on technology, economics, the natural world, and more. Please feel free to respond with any feedback. Enjoy! This groundbreaking book shakes the foundations of our concept of knowledge, from the role of facts to the value of books and the authority of experts, providing a compelling vision of the future of knowledge in a connected world. In this lively and illuminating discussion of his landmark research, esteemed primatologist Frans de Waal argues that human morality is not imposed from above but instead comes from within. Moral behavior does not begin and end with religion but is in fact a product of evolution...Rich with cultural references and anecdotes of primate behavior, The Bonobo and the Atheist engagingly builds a unique argument grounded in evolutionary biology and moral philosophy. Ever a pioneering thinker, de Waal delivers a heartening and inclusive new perspective on human nature and our struggle to find purpose in our lives. I've also made a booklist for you in our online catalog: http://bit.ly/1xy8Zek. You'll notice a few more titles not mentioned above - these are just a few more recommendations. Once you sign in to your account, you can easily place holds on any or all of these books. Please don't hesitate to reply to this message letting us know what you think about my suggestions and this service. Happy reading! I love these recommendations. Thank you. Interestingly, Sonya Sotomayor was a board member at one of the government agencies where I once worked, and, at one point, I wrote an article in the form of an "open letter" to her about eminent domain abuse. As for the bonobos, that is relevant to some of Francis Fukuyama's discussion. I recall, we currently believe that chimps and bonobos are both more closely related to humans than they are to each other- Hmm. Figure that out. (Link below.) Francis Fukuyama focused in on the behavior of chimps and might have gone in a somewhat different direction in his thoughts if he'd focused on bonobos. This librarian sounds like a nice and interesting person. Wouldn't you like to meet her in person? The email I got back gave her name and specified her title as "Librarian, Brooklyn Public Library." Here are some other things I learned about her. Her email told me something that I had not gleaned from BPL president Linda Johnson's presentation to the BPL trustees: She was responding using an OCLC ("Online Computer Library Center, Inc.") email address, not a BPL email address. 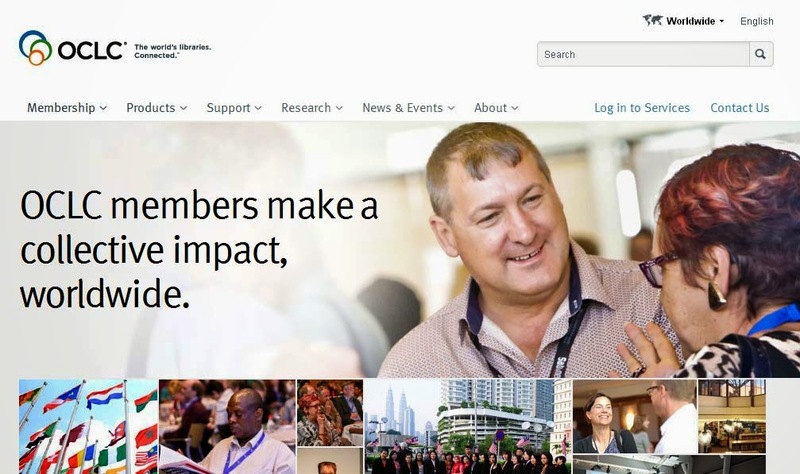 On the web page that popped up for OCLC it says about OCLC: "The world's libraries connected. . . . OCLC members make a collective impact, worldwide." Disappointed, I thought that maybe my friendly assigned reference librarian wasn't a New Yorker and didn't work for the BPL. But on Facebook I learned hearteningly that she lives in New York City (likely even in Brooklyn!- Williamsburg to be exact), came from Chicago, Illinois after studying Library Science at University of Illinois at Urbana-Champaign. From Twitter I learned she is a poet. A real person living in my city doing real things! She is even a trained librarian working as a librarian, but apparently she doesn't work on staff for the BPL. She works at Teachers College, Columbia University. Maybe my quick response from her was by reason of her weekend moonlighting. In promoting a just announced (but, like many others, very long in the works) plan to to redevelop the Sunset Park Branch Library into a "Mixed Use Real Estate Opportunity" the BPL is having conversations directed at the local community promoting this proposed redevelopment by telling people, in part, that the the development can be viewed as a jobs program (30-35 construction jobs during an estimated two years of construction) because construction means jobs. But, think, if the administration of libraries can be conceived as a jobs program as the BPL was making the case, why not consider that the jobs that librarians do are important jobs to keep and provide. . . worth publicly paying for even when that means setting aside worship of technical efficiencies? During the Great Depression the WPA (the Works Progress Administration) hired artists and theatrical performers to ply their trade, essentially almost to be themselves. Mightn't it, in this day's challenging economy, make sense for the government to hire and pay people just to be smart, well read, informed and, without an agenda, informatively out and about and intermingling with our local communities, particularly with the goal of being in service to others, those most intent on self-educating themselves? Would it be important to insist that these people focus on being "efficient" in their interactions, doing as much as possible with as few bodies as possibe? Did we/should we have demanded this of the WPA artists and performers? `Efficiency' may not be all that it's cracked up to be. The great urbanist thinker Jane Jacobs, a proponent of the benefits if diverse, differentiating and naturally evolving development in books like "The Nature of Economies" looked askance at the "supposed efficiency" of monopolies and, with Detriot being one of her examples, she denounced specialized efficiency at the expense of diversity, considering it a prelude to economic stagnation. Economies that sacrifice ample diversity, like ecosystems that do so, are less adaptable, less stable, less resourceful, less able to improvise, less able to develop and evolve. To Jacobs, an economy with few sorts of niches for people's different skills, however efficient, is one that suffers impoverishment. The proposed redevelopment of the Sunset Park Library weeks ago is the first time such an announced redevelopment of a library by the BPL has involved a proposed increase of library space rather than another shrinkage since Citizens Defending Libraries has been on the scene shedding light on the BPL's real estate ambitions. It would be flattering to think that the increase in size as part of the proposal is even a reaction to knowing that Citizens Defending Libraries is on the scene. Ironically, the BPL is hinting that it may give the Sunset Park community what it wants, a library that might well wind up being larger than the small size down to which the BPL is concurrently proposing to shrink the central destination Brooklyn Heights Library. The Sunset Park community wants a new library that is two stories above ground, and for that space to be more than the 17,000 square feet the BPL initially proposed. The folks in Sunset Park say they miss the two-story, above-ground Carnegie library the neighborhood once had that was larger than the box that has replaced it there now. The BPL is responding that it sees the sense of what the community is requesting and is looking to accede if it can secure some increased funds. By contrast the BPL is planning that the Brooklyn Heights Library would consist of only 15,000 square feet of such above-ground space with 6,000 square of ancillary below-ground space. While the Sunset Park library is proposed to have more space, the BPL has not fully updated its sales pitch and is using many of the same words to describe why its hurried priority must be redevelopment of the Sunset Park library to make it `work better.' (The BPL currently now rents out space in the library to Workforce1 that it could easily reclaim to expand without redevelopment.) If you know the code words, the same words and overlapping phrases may hint at the same kind of staff and librarian reductions for Sunset Park as the BPL envisions for Brooklyn Heights: "probably the most important issue . . . this current layout. . is not adequate to the services that are needed in the community today. . . we need more technology." The BPL spokesperson also again referred cryptically to existing space that "is not usable." That phrase, used quite frequently in PR promotions for shrinking libraries, seems to refer often to space used by librarians and for them to exist in. This branch isn't laid out in an ideal fashion. I don't want to. . . [He then named two Librarians by name], they deserve lot's of space, but unfortunately, in this branch right now, there's probably more staff space than is ideal. So if we can start from scratch we can get that mixture, that balance of staff space and public space. We can probably get a little closer to where we should be. Again, we have the opportunity to create a modern, technology rich and welcoming library. Well now that I have my book recommendations from my email pen pal of a librarian I'll have to plan to get the books. But since books, like librarians, are disappearing from the library and are not available at the library until ordered (like Amazon), I'll have to order them to come in to my library from where the BPL now keeps its much smaller collection that mysteriously `floats.' The BPL administration says the `floating' books not at the libraries you visit can be available with “usually a week’s turnaround” (that's a week after the previous week's expected turnaround with the email reference librarian). The time might even be less, but reports are coming in that it often takes nine to eleven days to get ordered books. I'll try to wait as efficiently as possible. One major factor in reducing the number of library workers is the automatic materials checkout machines. But they are chronically broken. Plus if checking out a DVD, the case unlock mechanism never works so you have to go to the checkout desk and ask someone to unlock it anyway. I think the trustees are being sold a bill of goods. Crappy machines prone to breakdown. I love the serendipity factor of browsing the stacks. Who doesn't? She doesn't obviously. Makes me wonder if she even uses libraries much less not being a librarian. Ah, yes. Finding other books than the specific one we were looking for as well as bumping into other browsers.